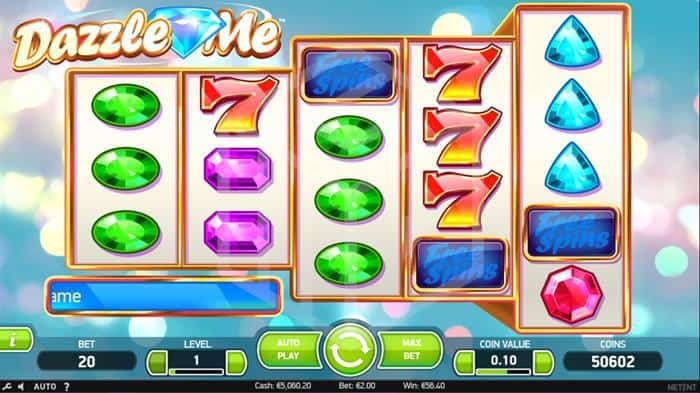 No doubt buoyed by the success of their earlier gem-based slots, Starburst and Twin Spin, Net Ent decided another was in order and duly released Dazzle Me in the summer of 2015. The irregular board set up (5 reels across with reels 1 and 2 containing 3 rows, reels 4 and 4 containing 4 rows, and reel 5 containing 5 rows) makes for a higher than normal 76 pay lines. 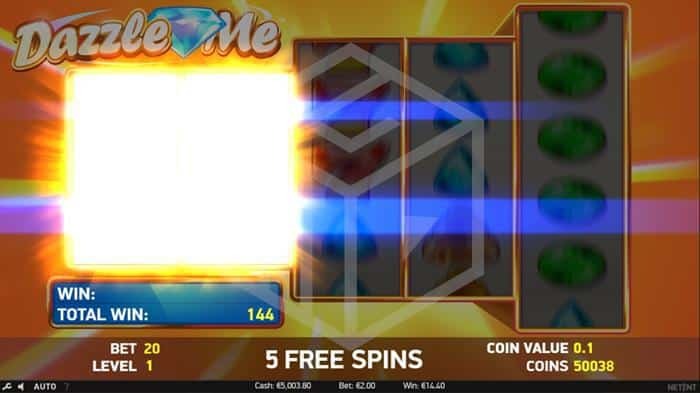 The game has an interesting free spin bonus round, a potentially huge playing stacked wilds feature in the base game and plays with an above average RTP of 96.9%, and spins are available from as little as €0.20 up to €400 per spin. There’s nothing to get too worked up about on the design front here. The board is set on a hazy backdrop of blurred bright, twinkling lights and the gemstones, bells and red seven symbols are all very familiar, especially for fans of Net Ent games. This isn’t to say the design is bad – these types of games have proven to be a hit on multiple occasions, so Net Ent obviously thought, ‘if it ain’t broke, don’t fix it’. The four lower value symbols are sapphires, emeralds, amethysts, and rubies, with the more traditional bells and red sevens the higher paying symbols. As with other similar games, these symbols are quite often ‘stacked’ making for multiple small-medium sized base game wins. The game also had a standard scatter symbol which is simply a block emblazoned with the words ‘Free spins’. There is also a Dazzling Wild reel symbol, which we’ll get to in just a moment. 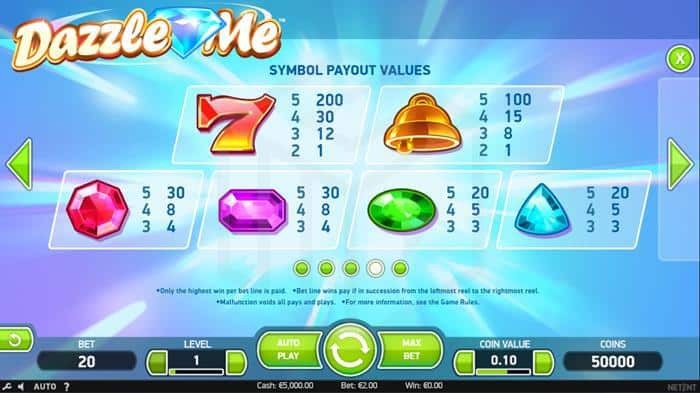 Once again Dazzle Me doesn’t exactly spoil the player for choice with special features although there is a decent random ‘Dazzling Wild Reel’ feature in the base game and free spins with linked reels as the bonus game. This randomly activated special feature only occurs during the base game and has the potential to produce some big wins. The feature sees the appearance of ‘Dazzling Wild Reels’ which consist of entire reels of dazzling ‘wild’ gemstones. Anywhere between 1 and all 5 of the reels can turn wild during this feature. As already noted, this can result in big wins, but more often than not you will only be rewarded with one or two wild reels. Hit 3, 4 or 5 scatter symbols and you’re off to the free spins round with a minimum of 8 spins (this is increased to 12 if you landed 4 scatters, and 16 if you landed 5). Unfortunately there is no option to re-trigger any further free spins. In a nod to Twin Spin, the appearance of Linked Reels during the free spin round can lead to some decent wins. Linked Reels mean that either (or both) of the identically sized reels (rows 1 and 2, and rows 3 and 4) can spin in identical symbols. As reel 5 is the only one with 5 rows, it will never be a linked reel. Although our review thus far might paint a bit of a mundane picture of Dazzle Me, that is more to do with the fact that there is little new or novel in the game which needs explaining rather than us not liking the game – far from it. As with both Starburst and Twin Spin, the lack of incredible graphics or multiple features doesn’t negate from the fact that this can be a strangely hypnotic and addictive game, something which it’s enduring popularity can pay testimony to.